Previously we mentioned about Amazon Kindle 2 featured with longer battery life and PDF support, now seems that the famous online bookstore provider has announced its third version with totally new refreshed and additional feature enhancements. The new model is being enhanced with 6-inch E Ink Pearl display that provides 50 percent better contrast suitable for reading pleasure. Besides, its page loading and turning speed is claimed to be 20 percent faster which would definitely a great advantages against other rivals’ products. To make it even perfect, voice command feature has been added on top of initial text-to-speech, not to mention about its new webkit-based browser (experimental) with free 3G web browsing and e-book download. Regardless of all the additional features being integrated into it, the new Kindle reader is now even more compact in design, with 21 percent smaller and around 15 percent lighter than its predecessor. And more importantly, its battery life is expected to be able to reach 10 days with WiFi turning ON, which is twice as long as its previous Kindle version. Priced at $189 (aff) and $139 (aff) for both 3G/WiFi and WiFi-only version respectively, the new models are available now and should continue its momentum as one of the most affordable ebook reader devices, competing against its strong rivals such as Barnes & Noble Nook and Sony e-Reader. 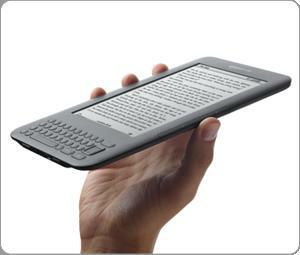 An cheaper version of Amazon Kindle with special offers and sponsored screensaver has also been introduced.